Each year, Augusta National reserves a number of spots in an already small field for past champions. Names like Mike Weir, Bernhard Langer, Fred Couples, Sandy Lyle, Ian Woosnam, Jose Maria Olazabal, and Larry Mize stand out because they literally come from a different era. For decades, the Masters invited ALL former champions to play, but when the list became too long, and their play became embarrassing (hello, Billy Casper and Doug Ford), they began “discouraging" the old boys from bringing their clubs. What do you think? Is it a tradition worth keeping, allowing past champs to come and take a spot that could be awarded to a current player? Should the old boys respectfully decline anyway? Or is it nice to have them play in the event? Matt Belacca, Director of Operations, Glendale: My thought is the Master’s is built on tradition, so it is nice to continue to invite past champions. I do believe they are in tune enough to realize when it is time to step down and decline the offer. I also believe they are not taking a spot from someone else as the Masters has a small field and entry is based on certain qualifications so I think they should keep this tradition going. Andrew George, Director of Operations, Station Creek: Its one of the great traditions associated with The Masters. Once you’ve earned that green jacket, you should have an open invitation to tee it up there as long as you want. Our game is rich with history, especially The Master. It’s a rite of passage for former winners. Dan Fatigati, Glen Abbey Member: The Masters by far is my favorite tournament of the year. Although of late I find myself defending the quality and depth of field in relation to other tournaments. Especially The Players that many feel should be considered a major. So, as much as I like the nostalgia of seeing the past winners, perhaps there should be a restriction and in turn provide the spot to current players who could actually contend. How much controversy have Tony Romo and Steph Curry created for being given sponsors exemptions over players trying to earn a card? Reid Ferguson, Member, Station Creek: I absolutely believe that the winners should be invited back each year until they are 60 or 65. There are not enough sports that pay homage to past Champions. Golf is one, and I applaud that. Why? Simply to recognize the tremendous achievement of that individual. Can you imagine not having the moment we all had when Arnie and Jack played their last round at Augusta. The Augusta Club controls the number of entries, so the past Champions are not necessarily taking a spot from another player. Ken Lane, Director of Operations, Caledon Woods: As a traditional old Golf Pro, I enjoy the Masters more than any other event on tour. With that, in my opinion, it is all about the traditions and anyone who wins at Augusta National should be invited back to participate. One can only imagine what it is like to relive the past success of winning after four rounds of Augusta and the old boys don’t get in the way of the important weekend battle to pass the green jacket. Mark Napier, Director of Operations, Heron Point: Tradition is what makes the Masters so great, the repeated playing of old footage during the current telecasts is always reminiscent for me. Having the past Champions return each year may be their best tradition. While many can’t compete with current players under today’s demands, I think they have earned their place in the field, and likely provide great insight to today’s players on course knowledge and handling the pressure. Most of the veteran, past Champions seem to recognize when it’s time to bow out of the Tournament, so to me, I think this is best left as is. Belacca: I struggled with this question as I do think they should add another honourary starter but to be honest I don’t know who. Nick Faldo came to mind as he has won multiple times. There is a part of me that misses Arnie and want him to be honoured as a starter every year. Interesting to see how this is played out. George: Jack and Gary should carry on with the ceremonial tee shot by themselves. No one can take Arnie’s place. Down the road, I think other former winners, who have retired from competitive golf, should be honoured on an individual basis. No group can match what these three great men did for the game. Fatigati: Another tradition like no other, the honourary tee shot. Three names synonymous with the golden years of golf. As much as it would be amazing to only have Jack and Gary carry on forever, it would be even nicer to see the tournament add 2 more players. Making it the morning foursome. Ferguson: It would have to be a past multiple winner. Ben Crenshaw or Nick Faldo come to mind. For me Ben who is a golf historian of note would be the pick. Lane: I believe this would be a good time to invite Tom Watson to the ceremonial tee shot. Tom is a traditionalist and has been great for the game of golf. His two wins at Augusta were during the playing days (era) of Nicklaus and Player. Napier: Each day when the TV coverage comes on, they always play the traditional “Masters” music and often lead in with the Opening Ceremony. It surely gets my attention and I get chills of excitement for sure. 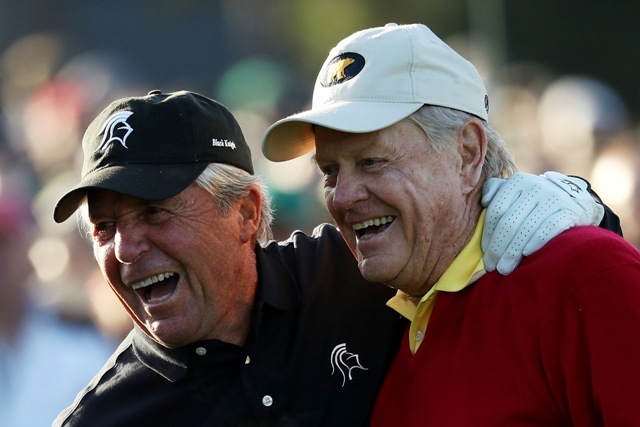 It’s great to see Jack and Gary Player hit their tee shots, but there’s an obvious hole in the lineup without Arnie. I think they should stay with just the two of them for a couple years, and to me, the next Honourary Starter would be Nick Faldo. As a 3-time champion and European representative, he would seem to fit the global appeal of the Masters. His contributions to the game continue as CBS Lead Analyst. Winning a green jacket is a combination of great ball striking and great putting combined with steely nerves and course knowledge. Experience seems to be a key, which is why throughout Masters history there have been a number of multiple winners and the same players are on the leaderboard year after year. Here’s a prop bet: a team of previous winners vs the current top 10 in the World Golf rankings (none of whom have ever won a green jacket) vs the rest of the field. Previous winners include Reed, Garcia, Willett, Spieth, Bubba, Scott, Schwartzel, Mickelson and Woods. World Top 10 includes Dustin Johnson, Rose, McIlroy, Koepka, Thomas, DeChambeau, Molinari, Fowler, Rahm and Schauffele. Which group would you take and who is your pick to win? Belacca: I am certainly taking the Top 10 field to have a winner; these guys are on top of their game going into the tournament. I can pick more guys on that list than the previous winners list. My pick is Rory McIlroy, he is due. George: I take a top 10 player who hasn’t won a major. Justin Rose is #1 in the world. Rory is lights out right now. Fatigati: I am a firm believer that some courses just suit some players more than others. Although the list of past winners does have a few one-timers, not to mention a few that are currently not on form. However, having said that I would take the past winners as it includes Tiger, Phil, Bubba and Jordan. I will take Tiger to win it all this year. Lane: Upon viewing the list of names, I’d bet against the past Champs based upon how much each of them seems to be struggling in their career. Without getting into the details of struggle, I think that any of the Top 10 could easily beat the list of past champions. I struggle to pick a winner amongst Johnston, McIlroy or Thomas, but will take Rory to step up and win the green jacket next week. Napier: I wouldn’t be surprised if any of the above names slipped on the Green Jacket on Sunday night this year, that’s the beauty of the Masters for me. If I had to bet though, it’d be on the current Top 10 list. I’m picking Rory this year to get the Grand Slam.